Michelangelo Merisi -- aka Caravaggio (1571-1610) -- was an artist in Italy during the late 16th and early 17th centuries. Now according to scientists in Italy, they have found his remains, centuries after his controversial life and lonely death. Caravaggio spent his childhood near Milan and was orphaned at the age of eleven at which time he was apprenticed to a painter. By the time he was 17 years old, however, Caravaggio had ventured south to Rome where he lived an impoverished life, looking for work as a scrapping artist near Campo Marzio. 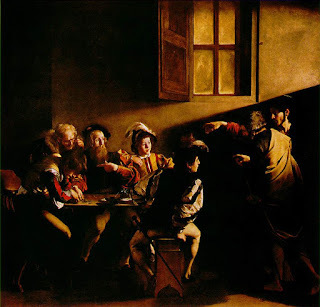 Over the next decade, however, he attracted some attention and started to earn commissions for his paintings which started Rome with their energetic compositions and striking use of chiaroscuro -- a contrast between light and dark. While his fame increased, so did his encounters with the law. He was arrested on several occasions for violent behavior until in 1606 he murdered his opponent in a tennis match and was forced to flee Rome. He spent the next few years in hiding in Naples and places in southern Italy. Influential friends in Rome pleaded his case before the Pope asking for a papal pardon, but the wheels of justice were too slow. The pardon arrived just three days after Caravaggio died. 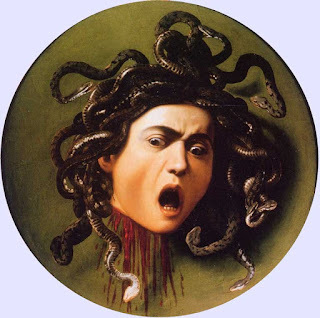 Though he was not a prolific painter, Caravaggio's influence on painting -- both in composition and in the use of light and dark -- has been profound. And his work is a popular museum draw. Last winter the Chicago Art Institute hosted an exhibit of his "Last Supper at Emmaus." And just last weekend a large show of his works closed in Rome at the Scuderie del Quirinale. That Caravaggio died in obscurity on a beach does not overshadow his genius. And now that his remains have been identified using DNA analysis and comparing them to remains of his relatives, it is easy to imagine a surge in interest. 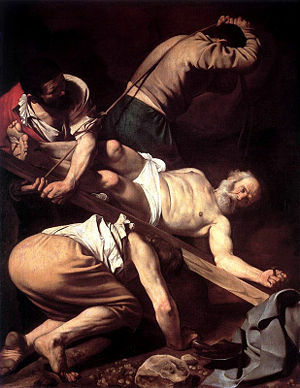 San Luigi dei Francesci (on Via Giustiani in Rome, Italy): this church houses three of Caravaggio's masterpieces ("The Calling of St. Matthew," "St. Matthew and the Angels," and "The Martyrdom of St. Matthew"). Santa Maria del Popolo (on Piazza del Popolo in Rome, Italy): here you'll find two paintings by Caravaggio ("The Conversion of St. Paul" and "The Crucifixion of St. Peter"). Galleria degli Uffizi (in Florence): the Uffizi hosts Caravaggio's "Medusa," "Bacchus," and "The Sacrifice of Isaac." National Gallery of Ireland (in Dublin): owns the most recently-discovered work by Caravaggio, a painting called "The Taking of Christ" which was attributed to Caravaggio in 1990.